I feel a bit strange writing about shaving "stuff". I do buy vintage shaving items and have some in stock but I usually buy them for their quirkiness or great design and not because I love shaving stuff! As I do now have a collection I have added some to my online shop and wanted to feature them here. For example this red mottled bakelite lidded container is lovely in itself. It has fitted compartments for the three piece razor and the blades. A gentleman came into the store recently and asked if I had any cut throat razors in stock, I had three different ones and he wanted to buy them all. Well, I had to make a pretty fast decision at that point, as to the chance he was some kind of Jack the Ripper character or a normal bloke who wanted to buy a cut throat razor... or two! It would be so embarrassing if today's sale makes tomorrow's crime headlines! More recently I had a couple of shaving enthusiasts and so have taken the time to sort through my stock and see what I have. First, are the shaving sticks, I loved these before I knew they were shaving stick holders, I used to keep all kinds of goodies in them. This red bakelite container is made by Erasmic and still has the "stick" in it which at first made me think it must be 60 years old as I expect the container is from the 1940's, but then I found out that Erasmic shaving sticks are still being made. They are no longer available in gorgeous containers though. For those who don't know the shaving stick process it goes like this, thanks to Badger and Blade site http://badgerandblade.com a must visit for all interested in more information. I cant leave the Colgate instructions without a sample of a Colgate stick, this one is empty but has Colgate written on the lid. Again a very cool mottled red bakelite container. For those who chose to use soap there was always the mixing bowl to lather up the brush, and this one looks like it can be re-used as an ashtray. Before I bought this Clubman shaving bowl in the original packaging, I had a red "ashtray" and never realised it may have started life as a soap bowl. What do you think? And of course Colgate had their lidded soap bowls too. Some of the items no longer have contents but are great containers in themselves like these Gem and Gillette razor boxes from the 1940's or so in cool deco shaped bakelite. I have a number of individual double sided safety razors, in various shades of brown, these samples are still in good condition today. Now onto razor blades... as soon as my husband knew I was writing this he recalled Gillette Blue Blade as one he remembered... but for all the wrong reasons. He remembers it went blunt as soon as it was used once or twice, meaning that hundreds of them were required over a short time. This probably lead to the introduction of what I call the razor blade safe - a little storage box for new blades, with a mailing slot at the back to safely deposit spent blades. This one still have a number of used ones as it is heavy and rattles! Also remember those metal bathroom cabinets with slots for spent blades to be safely stored? These Smith razor blades have never been opened, lots of them for sale. Great for display or a collection and they probably still work fine! And last but no least my favourite razor in stock, a one sided safety razor in its own fitted box. Made by Valet and seemingly over engineered based on today's throw away options but what a beauty! 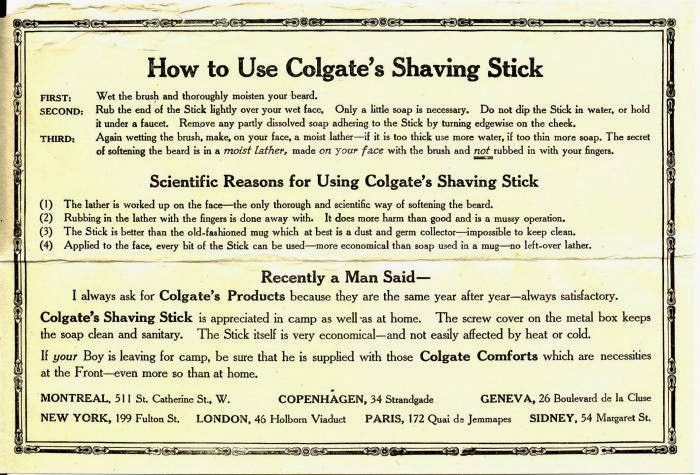 So, for collectors or those with a passing curiosity, there are lots of items to bring back the memories of the good old days of shaving history.... and ooooh yes little bits of torn toilet paper and the styptic pencil! Contact me if you are looking for something specific or visit my online shop.